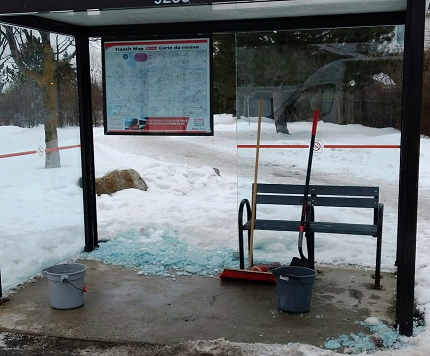 Sometime overnight on Tusday January 24th 2017 over 20 OCTranspo bus shelter were vanadalized where the glass panels were smashed resulting in several thousands dollars in damage. The incidents occured in the Orleans area along Charlemagne Blvd, Jeanne D’Arc Blvd, Innes Road and Montreal Road. Investigators are seeking the public’s assistance with information leading to the person responsible. If you know the identity of the person(s) responsible call Crime Stoppers toll-free at 1-800-222-8477 (TIPS). Remember Crime Stoppers does not subscribe to call display, we will not ask your name or record your call and you are not required to testify in court. If your information leads to an arrest, you could qualify for a cash reward of up to $2000. You can follow us on Facebook, YouTube and Twitter.